Cloud computing is the new buzz in the high tech world, but what can it do for you? Well you can use it as a virtual computer so you don’t have to house applications and other memory gouging programs on your hard drive. This will open up more room for your personal files (and eventually will lead to faster computing by allowing more of the computer’s memory to be allocated to the RAM functions instead of storage space). This guide will show you how to use the internet as a second computer. Obviously there is need for an internet connection to participate in cloud computing. The first step in setting up your virtual computer is to choose a cloud computing service. Microsoft has one and it has all of the advertising power to make it seem like the only option, it isn’t. There are several good personal cloud computing services on the web including Tonido. You will first need to create an account with one of these cloud providers. Most of them offer several different levels of service including things like a virtual hard drive for data storage and backup and access to different suites of productivity software. A quick Google of “cloud computing” will land you several perspective choices. Once you have chosen a cloud server you will have to create an account on their shared database. This is the interface area of the site. From the login page, you will be able to jump to applications or upload/download files. The beauty of a shared database is that several users can access the same productivity software at the same time and because everyone has paid a membership fee, the cost of applications is spread out among everyone. This means the number of applications available far surpasses anything a single user could hope to have at a fraction of the cost. There are several cloud computing services that offer just this type of setup. 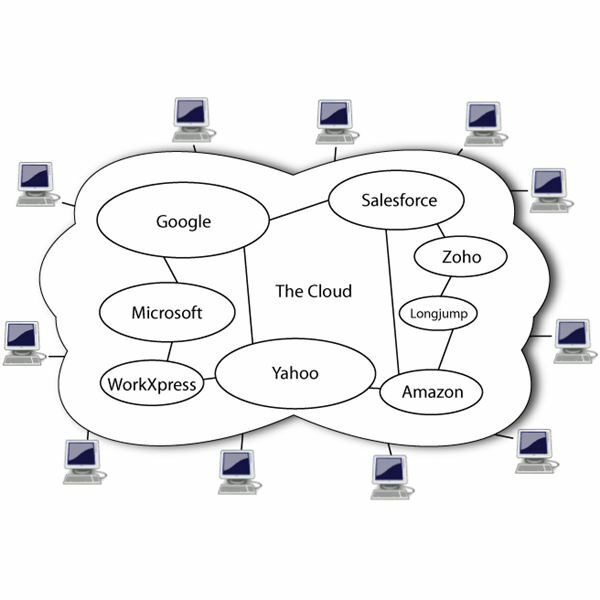 Having a presence in the cloud allows a user to access files from places other than their home computer. Using the internet as a second computer for storing data to be accessed from a remote location means no more lugging around a bulky laptop. The user will be able to access the cloud from any computer with an internet connection including those at public libraries, hotels, friends’ houses or even at work. This means that people working with sensitive data don’t have to worry about taking a laptop back and forth from home to work every day. Projects can be started at work, saved to the cloud, then accessed and worked on from home later in the evening. This type of access is great for people who travel a great deal especially for work. Saving a document in the cloud will make it safe from hardware failure. With a virtual hard drive on the Internet, there is very little chance of losing important information. There will be no need for backing up data to a secondary hard drive or tape system because the information is stored securely in a file that can only be accessed by someone with the user account name and password. Again, this is great for people with jobs that require their data to remain secure. The familiar feel of most of the cloud computing services will leave you with no doubt about how to use the Internet as a second computer. Microsoft has several options and each has step-by-step instructions that guide you through account set-up and even offer tutorials on how to access applications and store data. Even novice computer users will be accessing the cloud as simply as pouring a glass of milk.